A lead is a potential contact for you and your organization. Saving leads in Hunter helps to keep a record of new people to contact to better automate your marketing efforts or to simply save important professional contacts. Saving a new lead in Hunter like adding a new contact to your agenda. You can always access to it, edit the information on it and import it in your favourite CRM. How can I add a lead? Leads can be saved directly from the Domain Search or Email Finder. Every email provided by Hunter with a full name has a “+” symbol next to it. To save a lead simply click the “+” button next to each contact you would like to save. In the bottom left corner of the screen you can open the currently selected list, change the list where you want to save the lead or create a new list. Make sure to set the list where you want to save your lead before saving it. N.B.You can also add a lead after using the Find Someone functionality to find a specific email in the Domain Search. You can also save leads while surfing the web using Hunter's Chrome Extension or Hunter's Firefox Add-on by simply clicking the “+” button next to each contact you would like to save in your list of leads. Go to the leads section of your account and click the + New Lead button after selecting the list of Leads where you want to create the lead. Complete the fields with the lead’s information.To add more information click the More fields link. If you only have the email address and the full name, Hunter will automatically enrich the lead with additional public information at no cost. You can filter all you saved leads by using the dedicated filters. 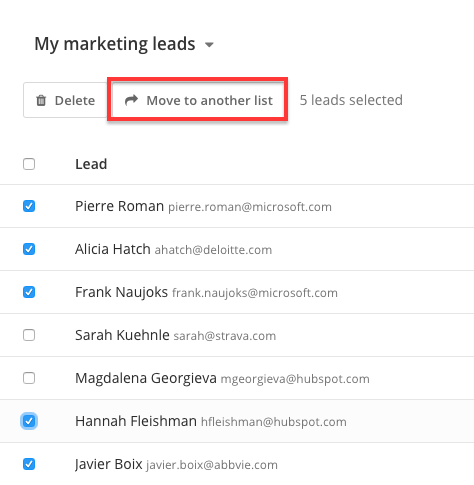 Your list of leads can be downloaded at a time by clicking the Export to CSVbutton located under the name of each list of leads. Simply open the CSV file with Excel or a similar software to edit or view to the downloaded leads. One or more leads can be move to a different list in just a couple of clicks. Select the leads you would like to move and click the Move to another listbutton. Select the destination list and confirm the change. Learn here how to send an email to a specific lead or create your first email campaign.